avocado tomatillo salsa & fresh pico de gallo. chips, guacamole, fresh pico de gallo, a creamy green salsa, and beer with lime. 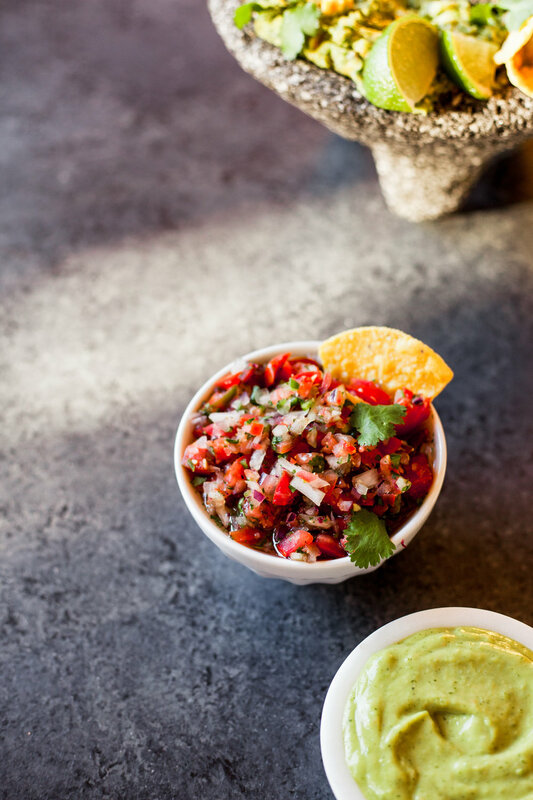 this avocado tomatillo salsa is inspired by the most delicious green salsa in town at rosita’s mexican grill in the greenlake neighborhood of seattle. my relationship with rosita’s runs deep and holds a very special place in my heart of the first years i lived in seattle. my friend ashleigh and i were even in a very embarrassing tv news spot about rosita’s when we were having happy hour there once. the news guy had us talk to the camera about why we love rosita’s (my worst nightmare already - i am famous for awkward word vomit and i belong behind the camera, folks). Then after we had finished our margaritas & food he CAME BACK to ask us to record it ALL OVER AGAIN because his sound was off (double whammy nightmare post-margaritas). 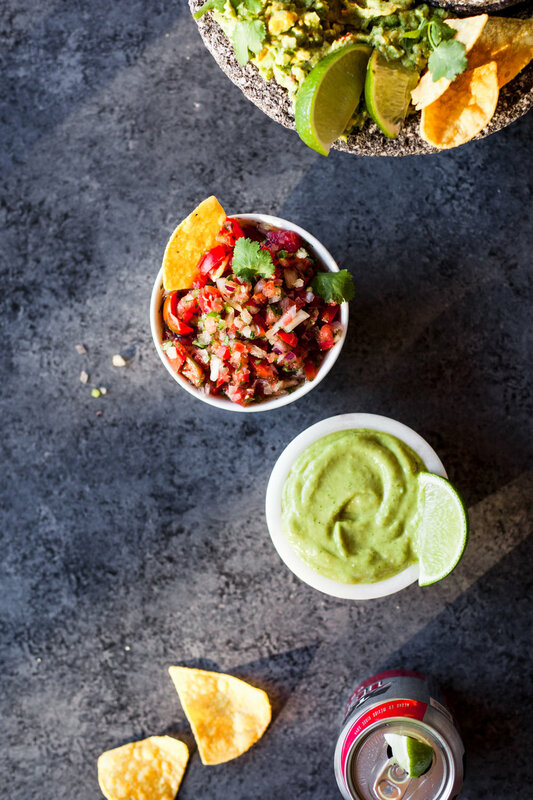 all that to say…rosita’s green salsa is incredible and i wanted to try and recreate it at home. i’m not even 100% sure what is in their salsa, but the version i came up with was very goooooood. i have a very vague guacamole recipe from like 4 years ago here on my blog. i will have to redo that guacamole post to make it more specific because it deserves it’s own spotlight! while i was at it, i wanted to add a super fresh pico de gallo recipe to my arsenal! so i made all three recipes last friday afternoon, just in time for a weekend trip to visit my bestie and her hubs. there were rave reviews of all three items and we even did a funny little taste sesh to put their taste buds to the test to see how many flavors they could identify. v wild friday night! this is how i know i’m getting older….lol. but it was fun! there’s soooo much chopping involved here - making all three of these items at once is a labor of love. i’d recommend putting a show up on your device and the time will fly as you chop chop chop away. the time spent is worth it for all these super delicious flavors that are ideal to share with a group or at a party! Preheat the oven to 450 degrees F and line a baking sheet with tin foil. Place the cut tomatillos cut side down on the foil. Place the unpeeled garlic cloves on the tin foil as well. Roast the tomatillos and garlic for about 15 minutes, until very fragrant and tomatillos begin to brown and bubble. Remove from oven and let cool. Squeeze the garlic out of the skins; discard garlic skins. In a large food processor, add the tomatillos, garlic, jalapeño, serrano pepper, olive oil and water. Process for a few minutes, until very well combined. Add the chopped cilantro, white onion, salt, vinegar and lime juice and process on high for a few more minutes until you can barely see the cilantro bits. Finally, add the avocado to the food processor and run until the salsa is very smooth. Add 1-3 tablespoons of water until the salsa reaches desired thickness. Chill in an airtight container before serving. Enjoy within one week. Chop and dice all the vegetables as instructed and add to a large bowl. Toss thoroughly with a spatula. Season with salt, pepper and lime juice and toss with a spatula until all the ingredients are evenly distributed. Add extra salt or pepper as desired. Chill in an airtight container before serving. Enjoy within 3 days. 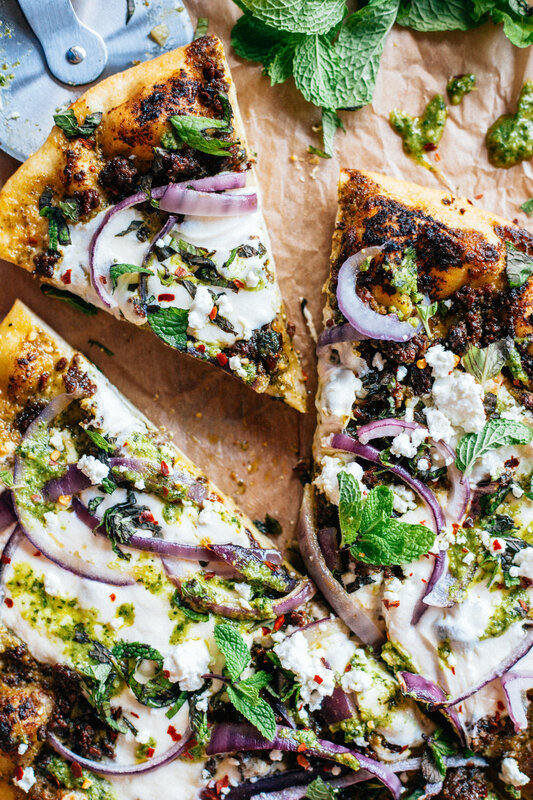 lamb, pesto, burrata & mint pizza. i've been yim yum yammering about this pizza for weeks now. IT IS SO WILDLY DELICIOUS. the flavors are totally insane and perfectly spring!!!! we made this thang 3 times within a week and then spiraled off and continued a binge of various pizzas for dayyyyys. sometimes that just happens somehow....you realize you've eaten pizza every day for like 7 days straight and you're like...how did i get here? cool. but yikes. but i'm not kidding this pizza recipe is REAL GOOD and i'm REAL PROUD of it. we've been making our homemade pizzas with a pizza stone which i really believe is a game-changer for the crust. BUT it's been terrifying and high stress times when it comes to shimmying the pizza dough off the parchment paper and onto the fiery hot stone in the oven. so we got real serious about it and bought a pizza peel and now we're selling pizzas out of our back door. 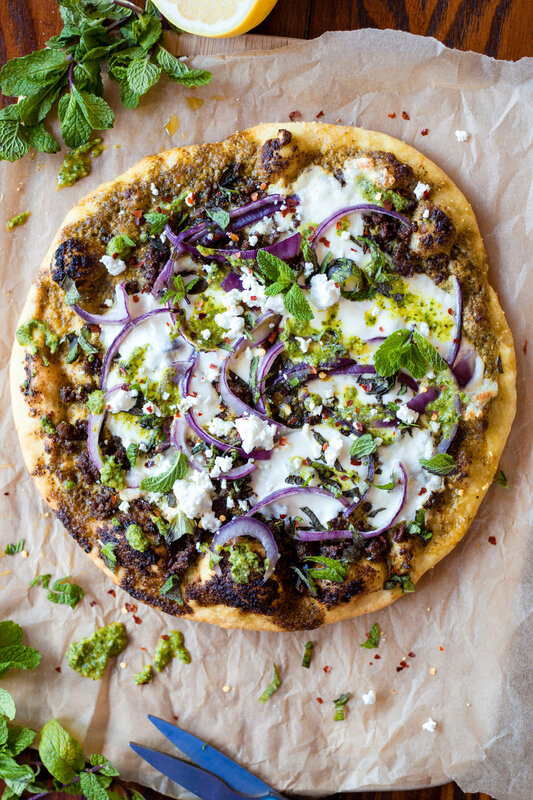 so first ya got a very simple and easy dough (bread flour makes it much betta than all-purpose in my opinion), a mint-pesto hybrid, peppery crumbly lamb, fresh creamy burrata cheese, zippy red onion slivers, topped with fresh goat cheese, tons of fresh mint leaves, and some red chili flakes. shoutout costco who sells the most amazing pesto! last summer, we took this VERY good chewy baguette, sliced in half with olive oil drizzled, threw it on the grill til golden and slathered it in costco pesto and holy moses that was one of the best things i've ever eaten. you can also make it from scratch, if you like. but the point is that you add extra fresh mint to the pesto and pulse it together! for that extra layer of mint flavorrrrr. actually i hope you're not freaked out by the mint on this 'zaw? its good. so veryyyy goooooood. i told ya we were having a moment with fresh mint lately next to these fab fresh rolls. 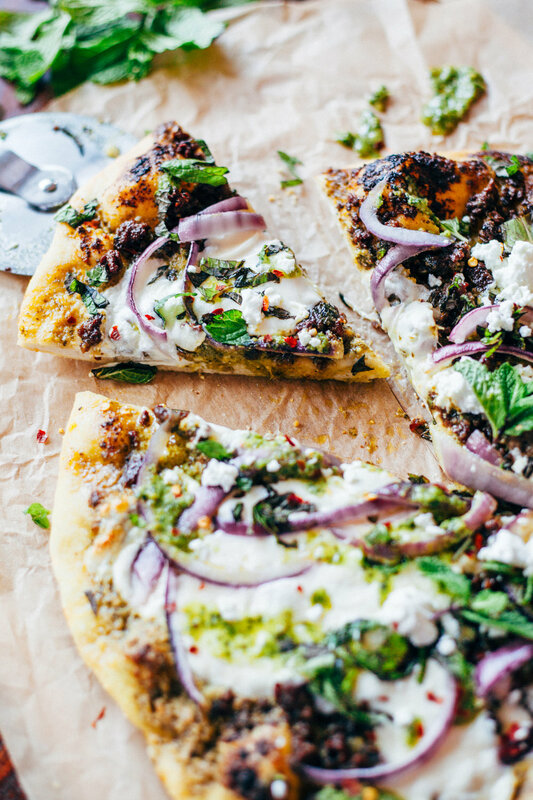 please make this pizza and go nuts over it like we did! For the dough, add warm water, honey, and yeast to a medium bowl and whisk. Let sit for about 10 minutes until it gets a bit foamy. Add the bread flour and salt, mix and use your hands to knead the dough together for a few minutes. Add a sprinkle of flour if it's too sticky. Use the olive oil to grease another large bowl and transfer the dough to this bowl, turning the dough to coat in oil. Cover with a warm damp towel and let rise for 1 to 2 hours, or until about doubled in size. You can make the dough in advance and freeze it in plastic wrap if you need to. If using a pizza stone, preheat it in the oven as hot as you can while you prepare the pizza, about 500 degrees F.
After the dough is risen, punch it down and turn out onto a lightly floured surface. If you're using a baking sheet and not a pizza stone, you can turn out the dough onto a lightly greased & floured baking sheet. Roll out as thin as you can, about 1/4 inch thick. Heat oven to 450 degrees F whether you're using a pizza stone or a baking sheet. If you're using a pizza stone, the oven should be be BLAZING HOT from preheating the stone, so be careful. We even bought a pizza peel for this step. For the mint pesto, add all ingredients to a small food processor and pulse until incorporated. For the lamb, heat the ground lamb in olive oil and minced garlic in a pan over medium heat. Add salt and lots of black pepper to taste, and a dash of red chili flakes. Let it get dark on each side before tossing the meat. I preferred it crumbly and peppery and almost blackened, but cook as you desire. 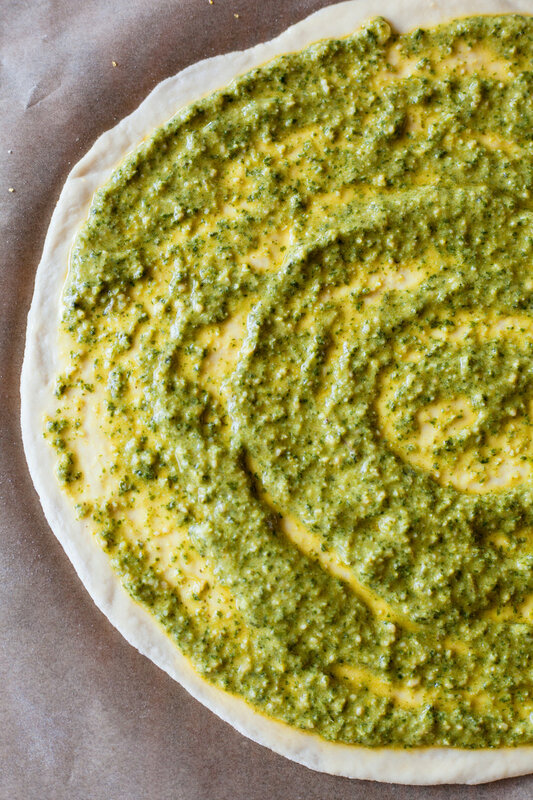 Spread the pesto over the dough, about an inch from the edge. Add the crumbled lamb. If baking on a baking sheet - add the remaining toppings now and bake the pizza in the oven at 450 for about 12-15 minutes until lightly browned on top. If baking on a pizza stone - CAREFULLY shimmy the pizza dough with pesto & lamb crumbles off the parchment paper and onto the hot pizza stone sprinkled in a bit of corn meal. Bake for 5 minutes to solidify the crust before adding the wet burrata. Open the oven door and pull the rack out just enough so you can break the burrata balls on top and sprinkle on the red onion slices. Bake for 5 more minutes. Carefully remove pizza from oven onto a large cutting board using an oven-safe tool. Sprinkle crumbles of goat cheese on top, along with torn fresh mint, and a few dashes of red chili flakes. Slice and serve immediately! Enjoy within 2 days.